Doomdark's Revenge is the second game in the Midnight Trilogy. The first part, Lords of Midnight, was widely acclaimed as one of the best and most original games to be seen on a Spectrum. 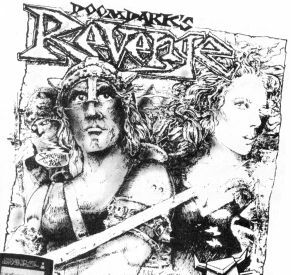 Doomdark's Revenge is a very similar style game with few major surprises although, if anything, the sophistication has increased, boasting 6000 map locations and a staggering 48000 panoramic views. One of the strongest points of these superb strategy games are their ability to accommodate two or more players since a set of characters can be shared out to ensure active participation for all. The game is set in the Land of Icemark to the north of the Land of Midnight. The Icemark Chronicles consist of five chapters in the glossy booklet similar to the one which accompanied the first episode of the epic. The burden of the Witchking's cold dominion had lifted from the Lands of Midnight like a sudden waking from a nightmare as Luxor's army made its way from the gates of Ushgarak to the Citadel of Dreams, a stronghold of the Fey. Tarithel, the beautiful daughter of the Lord of Dreams and lady of the Forest since her mother relinquished the title on Solstice Eve, excused herself from the celebrations finding a strange longing to visit a secret glade deep within the forest. Here she sees a boy riding oblivious through the trees and she makes use of her special powers to call the boy's stallion back. Several Mills & Boon stanzas later, Morkin, the young man riding through the forest, and Tarithel are to be wed so that the Fey and the Free can be as one under the protection of the House of the Moon. On the eve of the wedding Morkin travels back at the dead of night to the spot where they first met. Here a great storm brews and crashes lightning about his head causing his stallion to rear, throwing him unconscious to the ground. He has a dream of a voluptuous temptress lying on a silken bed. When he awakes from his disturbed slumber he sets off at once for the source of his vision - Kahangrorn in the far north of the Frozen Empire, home of Shareth the Heartstealer, Empress of Icemark and dread ruler of the Frozen Empire. It was decided that the Lord of Dreams would remain in Midnight to marshal the Fey and the Free while Rorthron would ride north with the Moonprince to the Frozen Gates, black cavernous tunnels that lead to secret ways beneath the ice. Rorthron with Words of Power and a roaring flame issuing from his staff led the way to the Gate of Varenorn. Meanwhile, far to the north Tarithel had lost Morkin's trail and was now following rumours to the City of Imorthorn in search of news. What you have just been reading is a précis of the Icemark Chronicles and in it you will find many of the facts necessary to succeed in the game. At the beginning of play you have three characters under your control, Luxor the Moonprince, Rorthron the Wise and Tarithel the Fey which have their own keys marked on the keyboard overlay (Morkin's key is not used until later in the game). Characters rallied to your banner can be chosen by way of the SELECT key. How long this list might become is reflected in the need for a MORE key which is similar to Scroll? in BASIC; 123 lords help command the five races of Giant, Dwarf, Fey, Icelords and Barbarians. Recruiting a character to your cause is not as easy as with Lords of Midnight. On one occasion when confronted with three lords who owed allegiance to Lorangrim the only options offered were Rest or Attack; no Recruit option was proffered. Rather odd, but no doubt, indication of some greater twists in plot than were evident in Lords of Midnight. Even when accomplished recruitment can lead to some unforeseen problems, e.g. Tarithel recruited a Lord of the Fey and was then killed by him. There are four commands to control a character, LOOK, MOVE, CHOOSE and CHECK. LOOK: eight compass direction views of the landscape corresponding to what the character sees in the direction he is looking. You cannot move at night, nor into the Icy Wastes that surround Icemark, or when exhausted or frightened. CHOOSE: the options put up on the screen will depend on the situation the character is in but will also reflect the particular personality of the character. CHECK: there are four check keys, Check Place, Check Battle, Check Army (details of your own army, any other army in the same location and any army immediately ahead of your character) and Check Person (some personalities may change as the game progresses). The game begins on the day that the Moonprince rides forth from the Gate of Varenorn into Icemark. During the day, which begins with a rosy dawn giving the screen a deep red colour, you move the characters under your control where the distance a character can move depends on the difficulty of the terrain, his vigour and whether he is riding or walking. Nightfall signals the beginning of movement for the forces of the Heartstealer, plus independent characters. Where this game proves more difficult than its predecessor is in deciding which of these independent characters may be friendly and how to go about recruiting them once you decide they are friendly. An army can either approach or attack an opposing force but the approach option should be used with some caution for if the approach is not fruitful and battle results you will be at a disadvantage. There is only one army in the whole of Icemark who will never rally to Luxor's banner - Shareth's forces, who are his mortal enemy. You, of course, play the role of Luxor the Moonprince. By virtue of the Moonring, which lends you the Power of Vision and the Power of Command, you control those characters in the Land of Icemark who are friendly to your cause, looking through their eyes at the surrounding landscape and guiding them in their many tasks. The Moonprince's victory can result from many different actions, representing a lesser or greater victory, but before any celebrations Luxor must return safely to the Gate of Varenorn. The most basic victory is the rescue of Morkin where the main hope of success lies with Tarithel. In any event, the safe return of both Tarithel and Rorthron is important while the successful retrieval of the Crowns of Icemark and the arcane objects brings greater victories. If Morkin should be slain only one victory remains possible for Luxor, Shareth's complete destruction. But this is no easy task as the grief caused by Morkin's death will greatly sap Luxor's strength. The greatest victory of all is the destruction of Shareth and the safe return of Luxor, Morkin, Tarithel and Rorthron to Varenorn, something you will discover is not easy at all. Glowing letters will flame on the surface of the Moonring revealing to Luxor the ancient Watchwords of Midnight which will protect Midnight for as long as he lives. The computer plays the part of Shareth the Heartstealer and controls the characters and armies under her sway. Independent characters may be persuaded to join her cause and hence quicken a victory for the Empress achieved through the death of the Moonprince. You are only given a very rough schematic map of the Land of Icemark when compared to that given with Lords of Midnight. There are five main realms marked on it. In the north-east is Shareth's Frozen Empire marked by a picture of an icy beauty in the place of more detailed cartography. To the west is the Kingdom of the Giants, in the south-west the Barbarian Outlands, in the east the ancient temples of the Dwarves and in the south-east the forest-dwelling Fey. You quickly leave behind the Frozen Wastes, mile after mile of treacherous ice, sheer drops and inhospitable peaks. As you make your way north, mists sent down from Kahangrorn obscure features of the landscape and hide likely dangers. The super graphic tokens of Lords of Midnight are expanded to include mountains, cities, forests, towers, pits, halls, huts, hills, fortresses, palaces, temples, gates, stones, fountains, icy wastes, mists and armies. Doomdark's Revenge is assured a huge following and deservedly so. It has improved on its predecessor in all the right ways with a more difficult set of tasks and a more sophisticated plot. Enemy and foe are not pictured as such and it is up to you to decide to what extent the widely varying forces can be cajoled to your banner. Of the individual leaders of the five races, each has his own lieges, hatreds and personality reckless or cowardly, greedy or worthy, brave or treacherous. The quirks in both character and plot assures a lively debate on the Land of Icemark for some time to come.